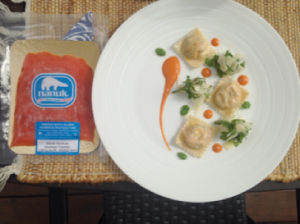 Smoked Salmon and Ricotta Ravioli | Recipes | Oceanfood Sales Ltd. Yields 8-10 Portions depending on how many you serve per portion. Poach a small dumpling of mix to check for taste and texture. Correct if required can add a touch of lemon juice and frech basil or dill if you wish. 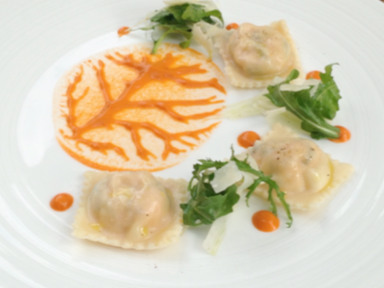 Construct raviolis using pasta sheets in a ravioli press. Fresh = 3min in simmering seasoned water (Do not Boil furiously) or they will break! Make a lemon salad dressing using 1part lemon juice and 3 parts light olive oil, season with a pich of salt and a pinch of sugar. Note: Add dressing just before serving! Place oil into pot and gently cook onion until tender, do not allow the onion to caramelize. Place the peppers and garlic into the pot and cover with a lid. Allow time for peppers to completely soften and puree through a high powered blender.